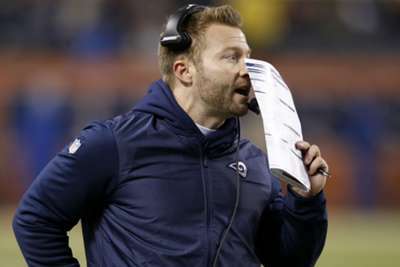 Sean McVay said he felt "sick" about the Los Angeles Rams' inability to take advantage of a strong defensive performance in a loss to the Chicago Bears that he blamed on himself. The Rams slumped to only their second defeat of another excellent campaign for McVay, who secured a playoff spot in his first season in charge and has steered them to a second successive NFC West title this year, with a 15-6 loss at Soldier Field. McVay's men have scored 425 points this season, the Rams coach seen as one of the masterminds of an offensive explosion in the NFL in recent years. However, they were held without a touchdown in Chicago, despite their defense forcing three turnovers from the Bears. And McVay took full responsibility for their failure to find the endzone, telling a media conference: "We didn't do enough to win and it starts with me, I continually put our football team in bad spots. I thought our defense played well enough, made enough turnovers and we didn't capitalise on them. "Consistently over and over I put our players in bad spots. Certainly a humbling night but it's one where you get a chance to look at yourself critically, find a way to get better, move forward accordingly and that's exactly what we're going to do. "That's all I know how to do. I've got to be better for our football team. "This loss is on me, I didn't do nearly a good enough job for us and I trust that we'll respond the right way. "I'll make sure that I learn from a lot of the bad decisions that I did make for us. Whatever I was deciding on clearly wasn't putting our players in good spots and I can't wait to just go back, look at the tape, learn from it and move forward. "I feel sick about it because our job, from an offensive standpoint specifically in my role as a play-caller, is to help the team move the football and score points and I felt like our defense played a good enough game, got enough takeaways, where they played winning football. "We are a team, we're going to stay connected, we're going to stay together but specific to my role with the offense I certainly feel very responsible."